In my last post I focused on the crucial skills sales leaders need in their teams in order to secure and grow those large value customers as outlined in our free eBook, Winning the Large Value Customer in 2018 – A Sales Leader’s Guide. Following on from this theme, I wanted to pull out another key topic from the book and share some of my top tips when it comes to helping your team overcome the common inhibitors to success. Build their confidence by encouraging small steps. Starting with good account mapping and research before progressing to more impactful actions. Remove the blame for trying and failing. Discuss early stage set backs and how to solve them in order to build a culture of ‘controlled risk-taking’ and reward and recognise the team members who take a leap of faith and open up large value sales cycles. Any sales team members with limited exposure to large-value customers can often struggle to identify which deals are really worth the effort. Helping individuals to develop the necessary skills to successfully qualify sales leads will not only improve success rates, but also streamline the use of resources for larger deals. Team leaders can, for example, agree specific and objective criteria with ‘go’ or ‘no-go’ milestones to clarify when a large-value deal is worth pursuing. I’ve often found that some sales professionals can struggle when it comes to acting as an advisor to a client and challenging their thinking. The concept that ‘the customer is always right’ is not always correct. For example, a prospective customer may have initially approached the team seeking a solution to a specific problem, but further research has revealed that a more complex – and costly – problem exists. Solving this problem will deliver for more value to the customer than the one described initially. Ensuring the team have access to the right collateral including relevant case studies are vital to evidence the financial, strategic or operating value of the solution. We all know that a large value customer has the potential for more to go wrong and will take longer to win. In the face of these risks some team members will stick to the smaller customers. The sales leader can challenge them to aim higher and publicise large value wins both in the team and the wider company. Constant discussion of examples of large value customers, what makes them buy and why the deal is large builds confidence and a momentum in the team. Targets very often with a quarterly focus can create an element of short-sightedness. If numbers can be achieved through smaller value customers, a sales person is less likely to invest time in high value customers. Sales leaders need to work with individuals to ensure a balance of run-rate businesses and higher value deals is being met. This balance maybe achieved within each team members sales funnel or in aggregate across the team with some members focussing on large value customers and some on run rate smaller transaction. Consistency of the selling team (sales & pre-sales technical) is key when securing those large-value customers, however, given how long these sales cycles often are, there’s a chance that you could lose an individual who has been heavily involved in the sales process before a deal is closed. In these instances, team leaders need to ensure that an effective and detailed handover takes place. This includes arranging face-to-face customer hand over meetings. It’s examples such as this that demonstrate just how important it is for sales leaders to have direct contact with large value customers in order to maintain continuity during staff changes. Finally, while a healthy dose of qualification and discussion in account reviews is essential in the sales cycle, it’s vital that overly negative commentary is avoided. 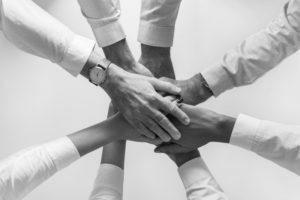 Sales leaders should seek to keep the team unified during account reviews by curbing negativity where necessary, while also ensuring that real signs of risks are not being overlooked. There will be setbacks and challenges during a long and complex sales process to win a high value customer, the sales leader should welcome bad news as an opportunity to take contingency action as early as possible. Want to know more about landing those large value customers? Request your free copy of our eBook below.